The ROOT SharePoint intranet portal centralizes access to important company information and apps right in Office 365. 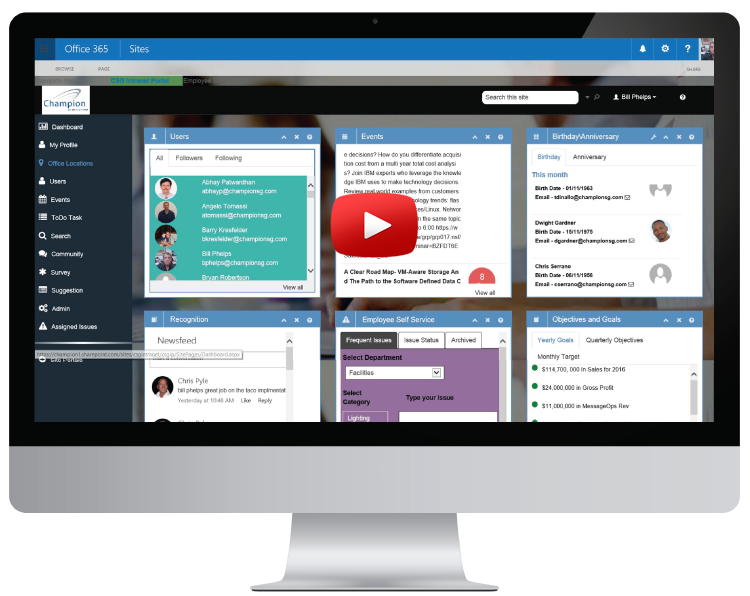 Ready-built, packed with features, and easily configurable, your company will engage employees, facilitate communication, foster collaboration, streamline processes, and organize your knowledge-base for quick, lasting productivity gains. Easily deployed and administered, ROOT intranet and human resource portal eliminates the complexity, cost and risk of a custom-built solution to bring immediate business value to your organization. 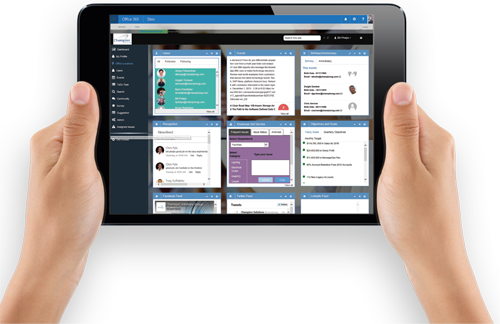 The ROOT Office 365 SharePoint Intranet portal lets your team communicate and collaborate no matter where they are or what devices they work on thanks to its completely device responsive, modern widget design. ROOT’s interdepartmental workflow designs bring immediate benefits to your organization by streamlining and automating workflow efficiency. ROOT’s enhanced people finder makes it easy for your team to find the people and skill sets they need to get answers quickly. Foster collaboration: Networking tools allow employees from different departments, teams and locations to find and connect with your company’s subject matter experts. Social and professional networks expand as employees become familiar with one another, creating a sense of community that supports collaboration and boosts productivity. Unify messaging: Every customer interaction, regardless of platform, should reinforce your core message and provide a consistent brand experience. ROOT enables your company to think with one mind and speak with one voice regarding corporate and departmental goals, marketing and industry events, and social messaging. Q1: What platforms can ROOT be hosted on? A: Your company intranet will be hosted on Office 365 for easy online access from any device and location. Q2: Can more features be added to ROOT? A: Yes! MessageOps has built flexibility into ROOT’s core functionality, which means we can add any features you need. An additional fee is required for this service. Q3: Can I request a personal demo to see how ROOT works? A: Absolutely! Our SharePoint consultants would be happy to show you exactly what ROOT can do for your business. Q4: What Office 365 Plan is required to run ROOT? A: ROOT runs on top of SharePoint online. The following Office 365 Plans come with SharePoint online: E1, E3, E5 Business Essentials, Business Premium. Q5: Can we rebrand ROOT to match our company guidelines? Q6: Can ROOT be deployed on-premise or as a private cloud solution? A: No, ROOT can only be deployed on Office 365. A: It takes up to two weeks to deploy ROOT. Rollout time may be extended if additional features or functionality are required, but it’s still faster than the 12+ months it would take to build a from-scratch intranet. Q9: Does ROOT support any mobile device? A: Yes! Responsively designed, ROOT can be viewed on any size screen on any device including laptops, smartphones, tablets and televisions. Q10: Is a large IT staff required to manage ROOT? A: Not at all! ROOT is easy to set up and administer. We’ll even train you on managing and administrating the portal as part of our deployment services. Q11: Is there a limit on the number of users who can access ROOT? A: Nope! We do not impose limits for the number of users who can access ROOT. Q12: Can I add more workflows, widgets, sites and libraries to ROOT? A: ROOT is built with SharePoint Online, which means you can customize, add and remove anything you want (within SharePoint Online’s guidelines, of course). You can choose to do this yourself or, for an additional charge of $150.00 per hour, we’ll customize anything you’d like!